In contrast to traditional Portuguese cuisine in the United States, which has little presence outside ethnic enclaves in southeastern Massachusetts, Rhode Island, Long Island, Newark, NJ, and central California, Greek cuisine is ubiquitous. From gyro stands to upscale restaurants specializing in grilled fish, from Greek yoghurt to stuffed grape leaves, from nuts and dried fruit to baklava, Greek immigrants to North America have left an indelible imprint on the food scene on both sides of the Atlantic. 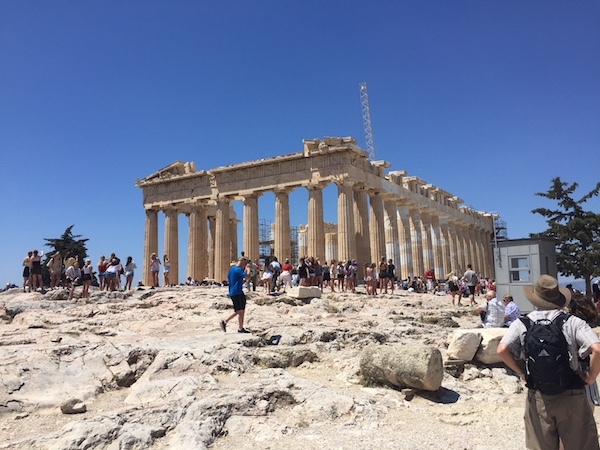 In fact, various receptions at the Greek Consulate in New York City, catered by culinary distributors and popular restaurants in the city, kindled our desire to visit Greece for our European side trip this year. Standard tourist photo of the Parthenon because I didn’t take any of the restaurants. Traditional restaurants are ubiquitous. In Crete that was all there was, and even the highly rated ones we ate at were mediocre. Ones that were praised online for fresh ingredients had to note on their menus (thanks to EU regulations) that their seafood was frozen. Fish were fresh but nothing special. We had similar experiences at traditional restaurants in and around Athens. The hotels we stayed at all had large and delicious breakfast buffets. The restaurants below are ‘new style,’ meaning they reimagine traditional dishes, making use of innovative techniques developed elsewhere in the world. These restaurants are devoted to procuring top quality Greek ingredients. Their wine lists are largely Greek and offer the opportunity to try local wines that come from small, often organic, producers. Prices for wine are reasonable. Meals in these restaurants averaged 40-50 euros per person for appetizer, main course, and a glass of wine. Aleria (Meg. Alexandrou 57, phone 210-522-2633; https://www.aleria.gr/en/) served by far the best meal we had in Athens. Each dish balanced a variety of high quality ingredients in a well thought-out and interesting way. The amuse bouche was a trio of delicate tastes. Their breadbasket is outstanding. A light curry went well with super fresh squid. Crab was well paired with a vegetable sauce. Couscous was expertly rolled and served with fresh seafood and a deeply flavorful tomato-based sauce. Desserts were complex and enjoyable. In additional to a la carte there are vegetarian and fish and meat focused tasting menus. The wine list is mainly Greek and the sommelier offered excellent suggestions of glasses to pair with each dish. Service was highly professional, a welcome contrast to most places in Greece. 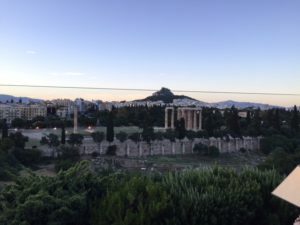 I did photograph the view of the Acropolis from The Zillers’ roof deck at sundown. Athiri (Plateon, 15, phone 210-346-2983 http://www.athirirestaurant.gr/index_en.html) served one of the best octopus dishes I’ve ever eaten. The octopus was cooked to a soft texture and served with a robust sundried tomato and caper sauce. Outstanding. The main dishes were well prepared but not earth shaking. Pasta with shrimp and a drum fish in a light sauce with vegetables were tasty. Dessert was a nice ending to the meal. Wines were smartly pared with the dishes. Mani Mani (Falirou 10; Phone 210-921-8180; http://manimani.com.gr/english.html) was the first new style restaurant in Athens and remains excellent. Fish and vegetarian dishes are better than meat ones. Service is professional, and the space is elegant and welcoming at the same time. The Zillers (Mitropoleos 54, Phone 210-322-2277; https://thezillersathenshotel.com/athens-roof-garden-acropolis-view/) is a roof top restaurant with fabulous views of the Acropolis. Fish dishes are especially good. Unfortunately, the music is loud as are many of the guests. Eat at Milton’s (91, Adrianou str. Phone 210-324-9129 www.eatatmiltons.gr) is located in the heart of Plaka, a partly car-free neighborhood of narrow streets. This restaurant has well-prepared dishes with fresh ingredients. Service is very friendly. I’m catching up with your posts Lyn, and was so happy to discover Richard joining in too for recommendations for Athens eating!